This is a collection of cards that are meant to reflect what it is like to learn to read with dyslexia. and show the emotional and scientific things happening in order to be able to read. This is illustrated by using pictures of people expressing a particular emotion and then taking some pictures of neurons and manipulating this in illustrator to get a proper silhouette and then using that as the mid ground. Then I used key words like incorrect synapse to indicate that there was something wrong also the picture was of a girl screaming this further emphasised the emotion of frustration. Which the emotive key word for the first card. The second card was about trying to soak up everything you need to be able to read. Also to show the emotion of contemplative, clueless, specie , a little worried. This was achieved by using a guy who's facial expression that looked specie to me. I also incorporated some of the same elements form the last card. The last one was about that final time when you realize you can read and feel like you can handle any thing thrown at you. This is achieved by use a picture a confident person. Once again incorporating some of the same elements form the other cards but with a few tweaks. 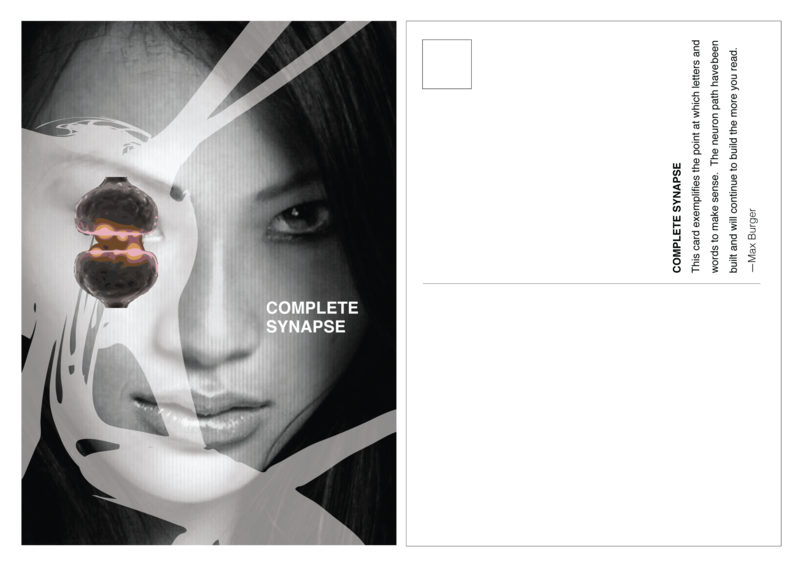 The keyword in this one is complete synapse. 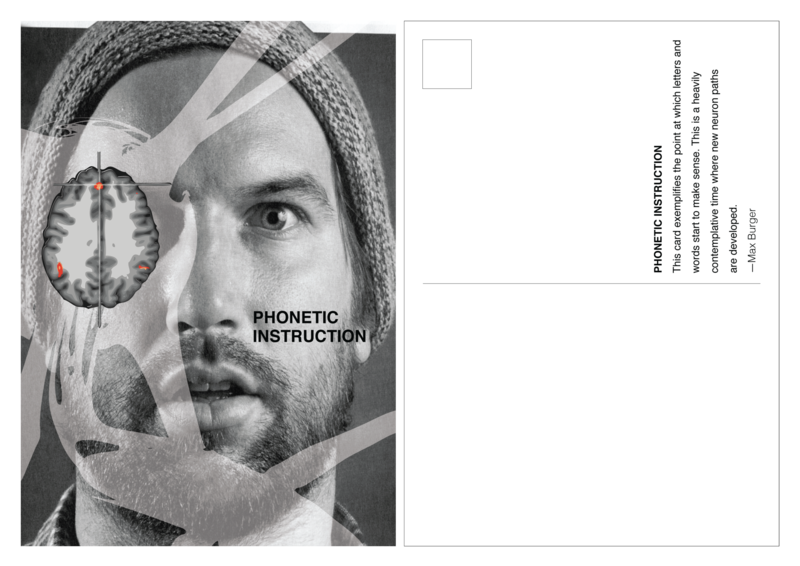 Because finally there is a complete synapsing structure in the brain that is helping you decode letters therefore making make it possible to read and write. This is a collection of cards that are meant to reflect what it is like to learn to read with dyslexia. and show the emotional and scientific things happening in order to be able to read. This is illustrated by using pictures of people expressing a particular emotion and then taking some pictures of neurons and manipulating this in illustrator to get a proper silhouette and then using that as the mid ground. Then I used key words like incorrect synapse to indicate that there was something wrong also the picture was of a girl screaming this further emphasised the emotion of frustration. Which the emotive key word for the first card. The last one was about that final time when you realize you can read and feel like you can handle any thing thrown at you. This is achieved by use a picture a confident person. Once again incorporating some of the same elements form the other cards but with a few tweaks. 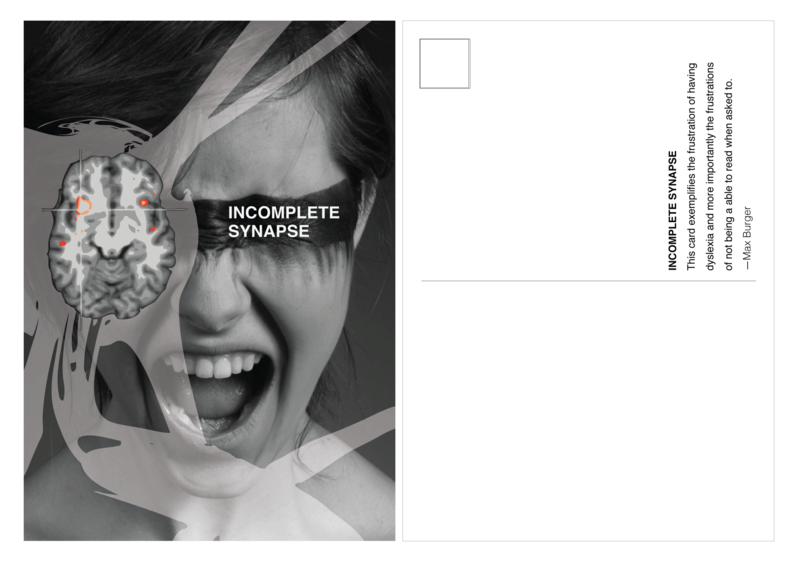 The keyword in this one is complete synapse. Because finally there is a complete synapsing structure in the brain that is helping you decode letters therefore making make it possible to read and write.